We’d love your help. Let us know what’s wrong with this preview of Imaginary Jesus by Matt Mikalatos. To ask other readers questions about Imaginary Jesus, please sign up. Okay- I'll give this book some credit, because the idea behind it is pretty brilliant. It's about how we can create a Jesus that we're comfortable with. A Jesus we like. A Jesus who never questions our views, who's politically correct, and who conforms to what we want. You can have a Gay and Lesbian Jesus, a Feminist Jesus, a Universalist Jesus- anything you want. And it's about how to address these "Imaginary Jesus"s in our own lives. It's sorta witty, a little bizzare, and VERY unexpected. (al Okay- I'll give this book some credit, because the idea behind it is pretty brilliant. It's about how we can create a Jesus that we're comfortable with. A Jesus we like. A Jesus who never questions our views, who's politically correct, and who conforms to what we want. You can have a Gay and Lesbian Jesus, a Feminist Jesus, a Universalist Jesus- anything you want. But the ending made a comeback, shedding some light on important truths that (I thought) were previously obscured by the wild plotline. So in the end- it's the last 50ish pages of this that made me add a star. Before that, I was annoyed, disappointed, and aggravated. Here's why. And here's the deal. I have no qualms about saying that I'm a KJV Bible believer, so naturally I would 100% disagree with this. This wasn't TOO overbearing, but still there. Do you know what the best-selling book of all time is? The Bible. The Bible is big business. It sells more than any other book ever, and every year it's the number one book. Bibles are in every hotel room you stay in. Many people own multiple copies, and they buy new ones when they wear out. Churches are stacked with them. Bibles are everywhere. No doubt God is extremely pleased that he is a best-selling author and that various new editions and study Bibles are constantly being put out. He did a good job on it- took his time and wrote it over several thousand years. It's an impressive book. #NOPE I completely disapprove of this. The Bible is an 'impressive book?' PUH-LEASE. The Bible is God's Word. Plus, when you think about it, the statements made don't make much sense. You're an author, and you've put all this time and effort into a book that you're proud of. Then, someone comes along and decides it would read better (or easier) if it was changed. So without your permission, they tweak it and release a new edition of your book, claiming that they've improved upon it. That wouldn't make any of us very happy, and it doesn't make God happy either. "I can see why you're comfortable with this Jesus," he said. I realized this might be the moment- the moment when Shane realized that he wasn't an atheist at all, that he believed in God and wanted to follow Jesus. "He's not the one I read about in your Bible, but I can see why you woul like him." And yet, while it seems like the author is trying to make a point with this, it's still like I said earlier. He still doesn't open up the Bible. Instead, the main character ends up finding Jesus at the center of a labryinth, which I found super interesting, since praying the labryinth is New Age I think. It's not that anyone is doing that New Age practice specifically (and the author is clearly opposed to New Age), it was just interesting. This book seems to advocate a sort of experience-based Christianity, but not entirely. It's as if the author wants some sort of perfect hybrid between experience and doctrine. However, most of what this author does believe must be pulled out of a helter-skelter plot (until the end), which left me scratching my head. Plus it's hard to tell when he's being sarcastic or not, which is even more confusing. This book was FUNNY. It is straight up Christian faux-fiction, a complex parable with all the standard moving parable parts: a moral to teach, animal characters, convoluted answers that force the reader/listener to consider various perspectives. To that point, Christian literature in general could learn a lot from how this book was presented. As an Agnostic, I read it based on the title, was sucked in after less than a page, and finished it thinking “Man. that was pretty damn good”. Imaginary Je This book was FUNNY. It is straight up Christian faux-fiction, a complex parable with all the standard moving parable parts: a moral to teach, animal characters, convoluted answers that force the reader/listener to consider various perspectives. To that point, Christian literature in general could learn a lot from how this book was presented. As an Agnostic, I read it based on the title, was sucked in after less than a page, and finished it thinking “Man. that was pretty damn good”. Imaginary Jesus, written by Matt Mikalatos, had me going. The basis for this book can be likened a lot to Gaiman’s American Gods, in the aspect that people’s gods can have different flavors and idiosyncrasies. In American Gods, a person or group brings their gods with them, as with the Vikings crossing the Atlantic. Their gods wax or wane in power depending on the tenacity of those who believe in them. But where American Gods was tightly centered around the lost gods, Imaginary Jesus is all about just one. NOW, when I say “just one” i mean that in the loosest sense of the phrase. Imaginary Jesus is actually about countless numbers of the man. Essentially this comedic parable is in existence to point out that Jesus is many things to many people, though there is only “One”. The story is loosely Autobiographical, with Matt and his search for the “Real Jesus” at the core of the novel. It opens with Matt sitting around the Red and Black Cafe in Portland Oregon. While in the cafe, Matt sits reading his bible, hoping that none of the locals notice that it is not Marx, else a one sided debate will open with a definite anti-xtian vibe. Sitting across the table from him is Jesus, who goes everywhere with Matt. Jesus is one of his best friends, keeping Matt company through out his daily tasks, even helping him get out of parking tickets. A man enters the Red and Black, and though no one else can, he sees Jesus sitting across the table from Matt. Discussions and a high speed car chase down the wrong direction of one way streets ensue. You see, the man who can also see Jesus is the Apostle Peter (Pete). Pete advises Matt that he is in the company of an impostor, an Imaginary Jesus. One that is a construct of his own mind and meets Matt’s specific desires for what the Christian God should be like. In chapter one, it just gets better, as that is all in the prologue (chapter zero). The novel follows Matt and Pete as they discuss and search out the real Jesus, so that Matt can meet him for the first time. There is a full cast in this book. Apostles, motorcycle angels, talking donkeys, a couple prostitutes, some Athiests, Mormon missionaries, and more. Aside from those just mentioned, Imaginary deities abound, each in varied levels of power as the populace who follows them may be weak or strong. These deities are formed together into the Secret Society of Imaginary Jesus-es, working together to continue to exist in the face of reality (no, I am not joking). All in all, this was a fantastic book. It kept me laughing through out, and even though I am not a religious person, I found it to be well thought out and presented in a fantastic manner. Matt’s savoring a cup of coffee at his favorite Communist bookstore…with Jesus. He’s been enjoying Jesus’ company for a while now, and although Jesus seems to be invisible to everybody else, Matt’s found him to be a pretty regular guy and handy for heading off things like parking tickets and other minor inconveniences. On this particular day, however, a big, hairy man barges into the coffee shop, full of righteous indignation and smelling of fish. He picks a fight with Jesus, and Matt’s tidy litt Matt’s savoring a cup of coffee at his favorite Communist bookstore…with Jesus. He’s been enjoying Jesus’ company for a while now, and although Jesus seems to be invisible to everybody else, Matt’s found him to be a pretty regular guy and handy for heading off things like parking tickets and other minor inconveniences. On this particular day, however, a big, hairy man barges into the coffee shop, full of righteous indignation and smelling of fish. He picks a fight with Jesus, and Matt’s tidy little world comes crashing down. The smelly guy with the solid right hook claims to be the Apostle Peter, and worse than that, he insists that Matt’s Jesus is no Jesus at all. He’s an Imaginary Jesus, and he’s up to no good. The bogus Jesus bolts, Peter and Matt in hot pursuit. Before they know it, they’re up to their armpits in Imaginary Jesuses, and Matt’s beginning to wonder if he ever knew the genuine article at all. 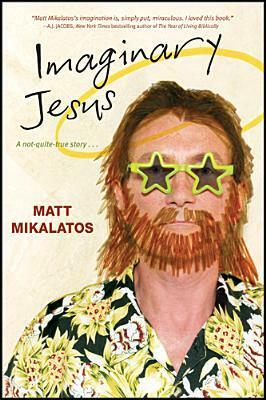 Matt Mikalatos’ Imaginary Jesus is a rollicking romp through time, space, imagination, and the human heart. No sacred cow is left un-roasted as the author fires up his satirical grill with a hefty squirt of comedic lighter fluid. I loved the way Matt made himself the protagonist of this story, the knucklehead who thinks he’s the only guy in the world who’s gotten Jesus right–so right that he can actually see Him and interact with Him on a day-to-day basis. It’s a fun, lighthearted tale. We’re treated to the quirks and foibles of life in Portland, Oregon; a side trip to the Holy Land, circa 33 A.D.; a talking donkey with an above-average ration of common sense; and a whole slew of Imaginary Jesuses–from Magic Eight-Ball Jesus (who has only fourteen possible answers–nine positive, three negative, and two indeterminate) to Testosterone Jesus (built like a weightlifter, but sweet and vulnerable on the inside), to Perpetually Angry Jesus (the name says it all). You’ll probably recognize most of them. Sadly, Matt is us. Matt is me. His illusions are shattered over the course of his journey across time, space, and Portland, and it left me pondering how many times I’ve done the same thing, presuming that Jesus and I are in agreement, that He sees things pretty much the same way I do, and that the world would be a better place if everybody would just get on the bus with Jesus and me. However, Jesus doesn’t promise to see things our way. He tells us, “If anyone would come after me, he must deny himself and take up his cross and follow me. For whoever wants to save his life will lose it, but whoever loses his life for me will find it.” Being a follower of Jesus means becoming conformed to His image, not the other way around, and that’s the central message of Imaginary Jesus. There’s another question at the heart of this story, a poignant question arising from a personal tragedy that drives Matt’s search for the real Jesus. After all the Imaginary Jesuses fall like tenpins and dissolve like smoke, leaving only the real Jesus, Matt poses his question again. He doesn’t get a precise answer, nor the answer he expected, but he does get an answer that ultimately satisfies him. Is there a happy ending? You betcha. In the final analysis, Imaginary Jesus is a personal struggle of faith cloaked in fiction. It’s a powerful tale, and perhaps more effective because of its humor and irreverence. It also takes a lot of guts to place your doubts, fears, and shortcomings on display in such a public forum, even in caricature. Kudos and thanks to Mr. Mikalatos for doing that and for telling us a fun, creative story along the way. At first glance, this book appears horrifyingly irreverent. The horrifying truth, though, is the irreverence with which we find ourselves inventing Jesus for ourselves, based on what WE need him to be. There is Free Will Jesus, who refuses to intervene in our lives, leaving our suffering to be the product of our own choices. He requires nothing of us, but this is hardly comforting when we face loss. There is also Meticulous Jesus, who involves himself in every detail of our lives. Reveling in ou At first glance, this book appears horrifyingly irreverent. The horrifying truth, though, is the irreverence with which we find ourselves inventing Jesus for ourselves, based on what WE need him to be. There is Free Will Jesus, who refuses to intervene in our lives, leaving our suffering to be the product of our own choices. He requires nothing of us, but this is hardly comforting when we face loss. There is also Meticulous Jesus, who involves himself in every detail of our lives. Reveling in our sorrow (because it ultimately glorifies him), this Jesus is powerful and cold. On his journey to find the Real Jesus, Matt encounters every modern-day (and a few ancient) perceptions of Jesus. He struggles to let go of them because, even as they are insufficient for his praise, he finds them comforting since they expect nothing of him. I was given this book by a mutual friend of the author. I wasn't sure what to make of it at first, but I was hooked by the second page. Imaginary Jesus is hilariously funny--one of the funniest books I've read in quite some time--and yet what begins as funny in the end is a sharp satire on America's consumer Christianity and the author's journey toward a more authentic understanding, and worship, of Christ. I personally enjoyed the whirlwind tour of downtown Portland, including many of my own for I was given this book by a mutual friend of the author. I wasn't sure what to make of it at first, but I was hooked by the second page. Imaginary Jesus is hilariously funny--one of the funniest books I've read in quite some time--and yet what begins as funny in the end is a sharp satire on America's consumer Christianity and the author's journey toward a more authentic understanding, and worship, of Christ. I personally enjoyed the whirlwind tour of downtown Portland, including many of my own former haunts (I miss Powell's!). Portlanders will get an extra bonus through familiarity with the book's real life settings, but one need not be a resident or expat of the Rose City to appreciate Matt's spot-on portrayal of the ways we manufacture "Jesuses" to fit our own image or the perceived needs of a given situation. Overall, I like the concept of the book. Also, I think that many of the observations about Christians and their "personal Jesus" is right on target. Sadly, I even saw a few of my own. Unfortunately, I felt that the author was dragging out, what would be, a great short story into a full length book. Hilarious. Was laughing from page one until the very last (yeah, with a bit of crying in the middle; there's some emotional stuff here). Although the humor is inspired, so is the theology. We all have our own versions of Jesus; it's time to meet the real one. Matt Mikalatos could have written Imaginary Jesus with a nice, quiet set of bullet points. He could have used some keywords with nice alliteration, and maybe thrown in a few anecdotes to keep things interesting. He would have gotten his point across, and it still would have been a a great concept. But he didn’t. Instead, Imaginary Jesus is sort of a semi-autobiographical science fiction pop-philosophy adventure novel. It stars Matt Mikalatos as himself, the Apostle Peter as a metaphorical spiritu Matt Mikalatos could have written Imaginary Jesus with a nice, quiet set of bullet points. He could have used some keywords with nice alliteration, and maybe thrown in a few anecdotes to keep things interesting. He would have gotten his point across, and it still would have been a a great concept. But he didn’t. Instead, Imaginary Jesus is sort of a semi-autobiographical science fiction pop-philosophy adventure novel. It stars Matt Mikalatos as himself, the Apostle Peter as a metaphorical spiritual guide, Peter’s pal Daisy the Donkey, and all the imaginary Jesuses you can think of. Matt and his Imaginary Jesus get along just fine. They hang out on weekends, and Jesus understands if Matt needs to fix a parking ticket or complain about a waiter. Jesus is cool like that, you know? They have a pretty good relationship. Until the Apostle Peter shows up. Peter, you see, spent three years walking side by side with Jesus. He knows what Jesus looks like, sounds like, what he likes to eat. He knows how He’d respond to practically any situation. So when Peter runs in to Matt at the local vegan Communist cafe, he knows another thing: that guy in the sandals sitting across the table from Matt? That’s not Jesus. The imaginary jesus, on being found out, takes off running. That begins Matt’s journey through time and space to find and abolish his Imaginary Jesus. Each of their stops (at a comic book store, in ancient Jerusalem, and at several Portland, Oregon landmarks, etc.) helps to show Matt what he’s missing about the real Jesus. He meets several members of the Secret Society of Imaginary Jesuses, including Political Jesus, Testosterone Jesus, and my favorite, Magic 8 Ball Jesus. There are some truly moving parts of this book. I’ve never had the “in remembrance of me” part of Communion explained quite this way. It’s changed the way I think about the sacrament. When Matt explains what it was that’s kept him from following the real Jesus, his pain is real and relateable. Which brings me to this: this is the funniest Christian book I’ve ever read. I don’t think I’ve ever switched from somber reflection to make-the-rest-of-the-train-car-stare-at-me giggling so quickly. Wait, no. My favorite bit was Motorcycle Guy. More giggling. More staring. Couldn’t help it. There were one or two things I could have lived without, like Houdini Dog, a neighborhood dog who steals Matt’s steaks off the grill and dirties his lawn. I’m sure there’s a great metaphorical reason behind the hound, but after multiple readings/listenings, I haven’t figured it out. Faith in the unseen? A cautionary tale to convince you to curb your dog? Imaginary Jesus doesn’t answer a lot of questions, but I don’t think it’s supposed to. Mikalatos isn’t giving you a list of what Jesus is. He’s telling you to let go of some of your precocieved notions of who Jesus is, and go to the source Himself. He wants you to spend time getting to know the real Jesus. You ever wanted to attend Monty Python’s Flying Sunday School. You liked Blue Like Jazz, but all that pipe-smoking gave you a headache. You’ve met Imaginary Jesuses (or their followers) and want to know what to do about them. I will say, this is probably my favorite religious-preaching-hidden-in-a-story novel that I've read. Maybe that's because it's not all that hidden-it's one man's personal search for the real Jesus amongst many fake/imaginary representations of Jesus that he keeps getting pulled into. It's a mix of real and imagined events that the reader it just supposed to be able to interpret what's *really* happening, and what's just thought process. All the imaginary stuff makes for a pretty entertaining rea I will say, this is probably my favorite religious-preaching-hidden-in-a-story novel that I've read. Maybe that's because it's not all that hidden-it's one man's personal search for the real Jesus amongst many fake/imaginary representations of Jesus that he keeps getting pulled into. It's a mix of real and imagined events that the reader it just supposed to be able to interpret what's *really* happening, and what's just thought process. All the imaginary stuff makes for a pretty entertaining read most of the time, though it does go over the top and on too long eventually. Like my sister seems to always say, this book could've used more edits. Plus, this story includes the talking donkey from the Bible, and I've always loved the talking donkey story (it never says it's the talking donkey from the Bible story, but I doubt it's mere coincidence). Anyways, this story can have some real insights, and extremely good/obvious visuals for the reader to understand the points being made by the ridiculous nature of some imaginary Jesus(es), so, you can read it to look deeply, or, you can read it as interesting and unique. Up to a point-like I said, it just goes on too long. One huge chase with the imaginary Jesus and all the other imaginary Jesus(es) getting in the way is enough-I didn't need the whole second one at the end of the book at all, and it greatly slowed my finishing of the book. It just goes on for too long and is too over the top. And, what can I say-all religious books meant to bring you close to God have extremely predictable endings with no interest. Obviously, this guy is going to find "the real Jesus" and have some profound moment, but someone can't feel a real life experience/revelation like that through a book-because it's fiction to you, even if it's not to the writer-you didn't experience it yourself, it can't make you find Jesus yourself. So, this book really stops being anything of value, at least to me, at about 3/4 through-with the exception that I liked the President story near the end. In the journey of the Christian faith, there is a sense in which all followers are looking to know the "real" Jesus better. Jesus, as we believe, is the perfect representation of God, very God himself, and therefore the example to man of the Father's will. That's all very theological, but Matt Mikalatos makes this journey after the "real" Jesus hysterical. His device is the Imaginary Jesuses (how do you make Jesus plural?) Showing up all over this story are the stereotypes that Christians use to In the journey of the Christian faith, there is a sense in which all followers are looking to know the "real" Jesus better. Jesus, as we believe, is the perfect representation of God, very God himself, and therefore the example to man of the Father's will. The ensuing race to rid the world of false concepts of Jesus proceeds to taking captive "Magic 8-ball Jesus" who only responds to questions (prayer requests) with the clarity of a Magic 8-ball. There's a race down Mt. Hood to see how Jesus actually knows the future, which involves bears and cliffs and karate kicks. There's a trip to the book store as seemingly Zombie-like Jesuses spring from the pages and chase Mikalatos, a talking donkey, a prostitute and the apostle Peter through the rest of the store. Harry Potter Jesus even flies alongside their car as they attempt an escape. All this hilarity (I was laughing aloud so much that my wife was becoming annoyed), leads to a very serious realization. Mikalatos discovers that the Jesus that he imagines actually is himself. He hates the same things Mikalatos hates. He winks at the little sins Mikalatos continually commits (they aren't that bad, you're forgiven) and has very little power to control anything, from a parking ticket to a tragic miscarriage. An entertaining, yet very strange read, this book will definitely make you think about how your perceptions can cloud the identity of Jesus. If you are a believer or not, this book will prove an intriguing read. Matt, the main character in the book is hanging out with Jesus in a cafe--but he's not the real Jesus. The reader quickly realizes this as he punches the apostle "Pete" in the face and goes on the run. Matt and Pete encounter many Jesus', all crafted by Matt's imagination. These imaginar An entertaining, yet very strange read, this book will definitely make you think about how your perceptions can cloud the identity of Jesus. If you are a believer or not, this book will prove an intriguing read. Matt, the main character in the book is hanging out with Jesus in a cafe--but he's not the real Jesus. The reader quickly realizes this as he punches the apostle "Pete" in the face and goes on the run. Matt and Pete encounter many Jesus', all crafted by Matt's imagination. These imaginary Jesus' generally take one aspect of Jesus' character to an extreme. The funniest part of the book was the society of imaginary Jesus', where hundreds of Jesus' try to convince Matt HE is the real Jesus. In the end Matt finds the real Jesus. The message is a good one, that we all have our own ideas of who Jesus is and it may not be correct. I think everyone can relate to this, because all of us at one point or another have known someone we thought about in one way, only to find out later they were completely different. For believers, this is true of Jesus, as we grow in our relationship with Him, we learn so much more about Him that is usually not what we originally thought. The weakness of this book is the lack of depth in the Main character. Matt is married, has a family, yet they are only mentioned. I never understood how Matt could take off for hours and days on end without a call to his wife. Its almost like the family was on paper only. Also not clear is why Pete (the apostle Peter) is roaming around people's subconscious with a talking Donkey named Daisy. I found this one through a list of free/cheap Kindle books. It was (and still currently is) free. That and the content makes it worth downloading.. It's a fun novel about a guy and his imaginary Jesus(es), who he discovers - with the help of a swarthy Peter and a talking donkey and some other friends - may not be the Real Jesus, but only the ones that make him feel comfortable. The story is a fun and surprisingly deep tour through all the different images of Jesus that are around today - hippie J I found this one through a list of free/cheap Kindle books. It was (and still currently is) free. That and the content makes it worth downloading.. It's a fun novel about a guy and his imaginary Jesus(es), who he discovers - with the help of a swarthy Peter and a talking donkey and some other friends - may not be the Real Jesus, but only the ones that make him feel comfortable. The story is a fun and surprisingly deep tour through all the different images of Jesus that are around today - hippie Jesus, anarchist Jesus, Mormon Jesus, New Age Jesus, emerging church Jesus, ... pick your favorite alternate Jesus and Matt runs into him. The book is set in and around Portland, Oregon and uses some cultural landmarks. If you've been to Powell's Books or the Red and Black or Voodoo Donuts, you'll enjoy the visits. I really enjoyed this one. It's a quick read, very fast, very fun and entertaining. The end is quite a bit more touching than I expected. There are a few awkward spots - some characters are written way more over the top than they need to be (Men's Retreat Jesus could have been SO much better, but as it was he was pretty funny). It's a good companion to something like Blue Like Jazz, although not nearly as profound. It would be great for questioning Christians, youth groups, open minded atheists, bored Christians. Anybody with a sense of humor about thier own belief system would get a kick out of this one. I have to say that this book was so much fun. It’s one of those books that while it’s funny and fast read, it’s actually deep when you think about it. I got about 3/4 of the way through it and had a wow moment. During Matt’s struggle to find the real Jesus, he has invented all of these imaginary Jesuses. These Jesuses do what he wants them to do, say what he wants them to say, but when it comes right down to it, are they the real deal. I got through this book in just a couple of hours, but it wa I have to say that this book was so much fun. It’s one of those books that while it’s funny and fast read, it’s actually deep when you think about it. I got about 3/4 of the way through it and had a wow moment. During Matt’s struggle to find the real Jesus, he has invented all of these imaginary Jesuses. These Jesuses do what he wants them to do, say what he wants them to say, but when it comes right down to it, are they the real deal. I got through this book in just a couple of hours, but it was a blast to read. I laughed out loud a few times. This is one that I am going to pass down to Jordan. It is definitely something that he could read and understand also, one that I think would be great for preteens/teens/adults who struggle with the “why doesn’t God talk to me” question. I had no idea what to expect when I requested this book…but once I started it, I did not want to put it down! I’ve struggled with what to write in this review without giving details away–all I can say is READ IT! It is FANTASTIC! “My Imaginary Jesus” is an incredibly creative work that looks at all of the different ways that we perceive/imagine Jesus to be as opposed to what the Bible actually says. The author seeks to dispel widespread misconceptions about Jesus while sharing about his own true I had no idea what to expect when I requested this book…but once I started it, I did not want to put it down! I’ve struggled with what to write in this review without giving details away–all I can say is READ IT! It is FANTASTIC! “My Imaginary Jesus” is an incredibly creative work that looks at all of the different ways that we perceive/imagine Jesus to be as opposed to what the Bible actually says. The author seeks to dispel widespread misconceptions about Jesus while sharing about his own true life struggle to find the real Jesus. I don’t want to give too much away, but I’ll say this: what makes the book especially awesome is that the author makes each version of Jesus (i.e. “Perpetually Angry Jesus” or “Legalistic Jesus”) its own character in the book which brings them to life and forced me to look at who I think Jesus is as opposed to who He really is. You can’t deny that the characters he writes about aren’t real in some sense–I have definitely had friends or family members who have viewed Jesus in these ways. The author presents the information in a very disarming way while leading you down a path to hunger for the REAL Jesus. I was very excited to see that he has another book…I think it will be my next purchase! This is one of THE best books I have ever read. While reading it I couldn't help but think of that quote that says, "You know you've made God in your own image when He hates all the same people you do." That's not to say that this book focuses on misconceptions of Jesus based on who we believe He loves or hates, but rather it confronts a multitude of "false gods" we as Christians have created throughout history by basically missing the point of Who Christ is and why He came to earth. Imaginary Je This is one of THE best books I have ever read. While reading it I couldn't help but think of that quote that says, "You know you've made God in your own image when He hates all the same people you do." That's not to say that this book focuses on misconceptions of Jesus based on who we believe He loves or hates, but rather it confronts a multitude of "false gods" we as Christians have created throughout history by basically missing the point of Who Christ is and why He came to earth. Imaginary Jesus predates Mikalatos' book Night of the Living Dead Christians, which I just finished reading a few days ago, so since I read them in reverse order you'll have to excuse me when I say that "once again" Mikalatos' writing is hilariously entertaining as well as thought-provoking. Chapters 34-39 offer some extremely poignant moments following the chaotic & humorous (yet profound) chase after one false Jesus after another, and more than once I was moved to tears in considering the REAL Christ. I have certainly tried to follow my own false Jesuses before, but this allegorical story reminded me in a moving way of how much I want to follow the true Jesus, even when it is more difficult than coming up with my own version of Him. This was a unique book to read. Told from the first point of view by the author, it is touted as "a not-quite-true story." The story is fiction, and the author has quite an imagination, but by weaving a humorous and at times rather bizarre story, he tackles the issue of people having the wrong view of Jesus, and our making our own version of Jesus to follow and serve. The book starts out with the author hanging with his own version of Jesus, Imaginary Jesus. He then goes on to meet several other This was a unique book to read. Told from the first point of view by the author, it is touted as "a not-quite-true story." The story is fiction, and the author has quite an imagination, but by weaving a humorous and at times rather bizarre story, he tackles the issue of people having the wrong view of Jesus, and our making our own version of Jesus to follow and serve. The book starts out with the author hanging with his own version of Jesus, Imaginary Jesus. He then goes on to meet several other Jesuses. The ones listed above in the book description and others such as King James Jesus, TV Jesus, Testoserone Jesus, and more. Though they may act in some bizarre ways and have amusing names, the author does a great job of showing how easy it is to focus on the wrong things in serving Jesus, and ultimately making our own Jesus to serve, whether it be a legalistic Savior, or one who grants our every wish. I had two issues with the book: one use of a curse word, the "d-word", being used by none other than the Apostle Peter - and a lot of wine consumption by the same person. Other than that, I think this is an excellent book that can cause the reader to examine his own life to see which Jesus he or her is following. This is a very interesting and entertaining book. It might seem an odd book for me to read since I'm not a Christian but religion does interest me, from afar, and the playful writing style of Imaginary Jesus appealed to me. I read it in the Kindle format and the free aspect also appealed to me. While the description of the book seems playful there's a lot of serious stuff going on under the surface of this book. Mikalatos essentially sets up strawmen arguments which are embodied by numerous false This is a very interesting and entertaining book. It might seem an odd book for me to read since I'm not a Christian but religion does interest me, from afar, and the playful writing style of Imaginary Jesus appealed to me. I read it in the Kindle format and the free aspect also appealed to me. While the description of the book seems playful there's a lot of serious stuff going on under the surface of this book. Mikalatos essentially sets up strawmen arguments which are embodied by numerous false Jesus' and strikes them down in whimsical ways. It's very light and readable yet at the same time philosophically meaningful. I ordered Imaginary Jesus for my kindle because it was free but it sounded interesting. It sounded like a promising concept - a humorous take on physical representations of all the fake Jesus's people create - kind of like Personal Jesus by Depeche Mode, but in book form! However, the execution was not so great. I was expecting something irreverent and laugh out loud funny (from the reviews) like Lamb by Christopher Moore. This was just not that funny to me. It was more puns and some not so humorous and cheesy mad-caps. I also found it a bit preachy and I didn't totally agree with the theology. The author did try to be pretty generic in terms of religion so it did have some interesting points (we all mold Jesus into what we want him to be). I did find it a bit hypocritical at the end, that the author's final version was the "true" Jesus, but no one else's is - especially the Mormons! Overall, it was a quick and very easy read...just not funny and a bit too preachy. Matt Mikaltos has encountered many Imaginary Jesus' in his life. They look like Jesus, they talk like Jesus, but often embrace only the "comfortable" part of Jesus' message. In this hilarious romp through Portland, OR and surrounding areas, Matt confronts his own beliefs as he searches for the real thing. The first few chapters of this book are just laugh out loud funny. The whole story in itself, kept me laughing, until it made me cry. Really challenges you to look at your faith and the Jesus yo Matt Mikaltos has encountered many Imaginary Jesus' in his life. They look like Jesus, they talk like Jesus, but often embrace only the "comfortable" part of Jesus' message. In this hilarious romp through Portland, OR and surrounding areas, Matt confronts his own beliefs as he searches for the real thing. The first few chapters of this book are just laugh out loud funny. The whole story in itself, kept me laughing, until it made me cry. Really challenges you to look at your faith and the Jesus you call king. Clever and really funny. Makes the point that we all create our own imaginary Jesuses instead of seeking the real one. We can't box the real Jesus in with our own beliefs and philosophies. He is so much bigger than that! Humorous, thoughtful, entertaining imaginings about the message of Jesus Christ to the people of the 21st century, I was fine with this until the end, when the author swerved from an attitude of open mindedness to his own, carefully defined idea of what it means to be a Christian. His depiction of the present-day Portland metropolitan area was spot-on, and kept me reading just to follow his adventures.